This recipe happened completely by accident. I was intending to make regular old pasta with red sauce and broil a zucchini to go with it, until I discovered that we had no red sauce in the house. We usually keep a jar or two of Newman’s around for easy, quick dinners, but alas, we were out. I know I could have made my own red sauce with the other tomato stuff we have, but suddenly it seemed like too much work. So like any good foodie, I promptly made more work for myself by inventing a recipe! Except this isn’t work at all, because it’s simple as heck to put together. It makes use of the abundance of veggies that can be found at farm stands and farmer’s markets this time of year: bell peppers, zucchini, yellow squash, and kale. 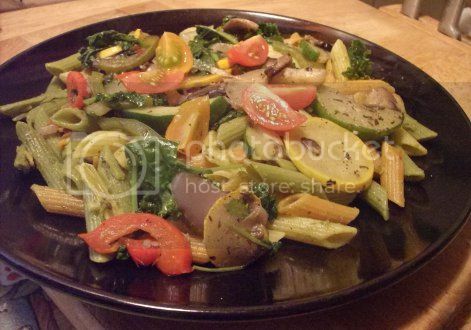 Tri-color pasta complements the rainbow of veggie colors. I used the neat tri-color penne that Ronzoni came out with recently. Totally my new favorite pasta! And if you’re feeling really enterprising, you can grab some fresh basil and make your own pesto. 1) Cook the pasta according to package directions until tender but not mushy. Drain and set aside. 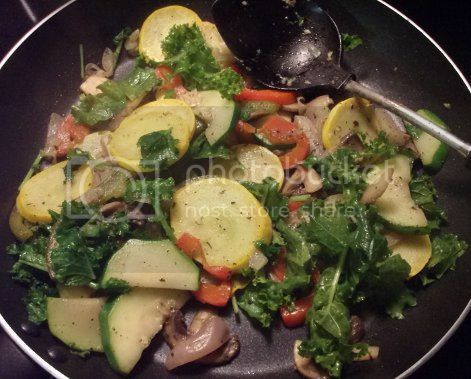 2) In a large skillet or saute pan, heat the olive oil over medium heat. Add the garlic and cook until fragrant, about 1 minute. Add the onions and bell peppers; cover and cook until softened, about 5 minutes, stirring occasionally. 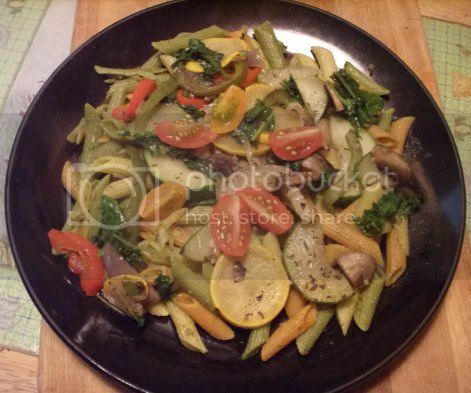 3) Add the zucchini and summer squash and saute until just beginning to soften, 3-5 minutes. Add the mushrooms and cover again. Cook until the mushrooms are tender and beginning to release their juices, being careful not to let the squashes get too soft. 4) Add the spices to taste. Toss in the kale and cook, stirring, until wilted. 5) Return the pasta to the boiling pan and warm it over low heat until hot. Add the pesto and served topped with the sauteed veggies. Garnish with cherry tomatoes and a little vegan parm, if you like.